The go-to watch for travellers, adventure racers, extreme athletes and those who enjoy life to the full without the need to worry about their watch - no matter how harsh the conditions. 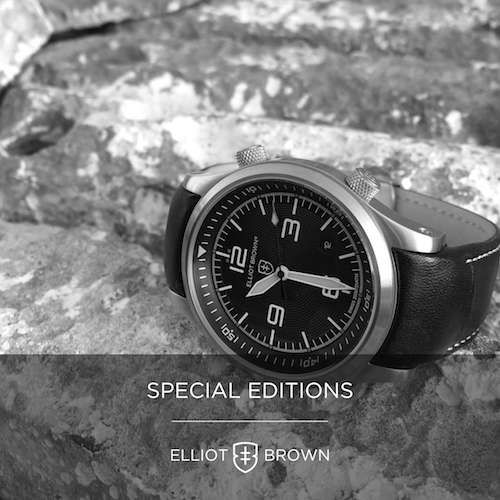 Special editions with Mountain Rescue England and Wales, the Clipper Round The World Yacht Race or the military epitomize the capability of every timepiece emerging from the rigours of the Elliot Brown test lab. Only after extreme testing can a watch truly demonstrate a level of durability that Elliot Brown's demanding ambassadors and athletes have come to rely upon. Capable and ready for action right out of the box, because prior to leaving the factory, they're smashed with 3kg mallets, dropped, twisted, rubbed, flexed, hit with ball bearings and submerged in 200m of water. Only then can each watch be declared ready. The fastidious detailing on every Elliot Brown doesn't shout 'look at me'; instead it exudes a more subtle kind of confidence. The scale and detailing evident in every component, beautiful surfaces, classic simplicity and perfectly judged functionality are all cornerstones that deliver unique, every-day wearability. Conceived in a demanding British coastal playground, every Elliot Brown is designed from the inside out to operate on an entirely different level - with inbuilt resistance to shock, water, sand, mud or snow. Every watch is covered by an all-encompassing warranty and fast turn-around, in-house servicing is ready and waiting if needed. Thankfully, equipped with a 5 year battery, visits back to base are infrequent. Every so often a watch comes along that's just so inherently "right" not only in the way it looks and feels but also to wear every day - for years. 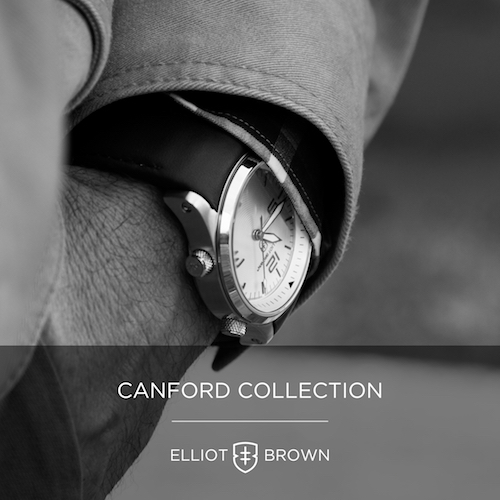 The Canford has it's own unique design language, broader of shoulder than some but with classic, less-is-more styling. Beautifully clear hour batons and hands with equally stunning night-time performance nestle beneath a tough anti-reflective crystal - nearly 3mm in thickness. The Swiss movement is protected inside Elliot Brown's unique shock damping shield system that floats inside the outer casing. Armed with a glass-smooth inner rotating bezel that's perfect for simple timing duties, there's a lot to like about the Canford. With design options to delve into including military grade anti-reflective black and gunmetal, gorgeous contemporary classics on rich brown leathers or retro brushed bracelets with neat micro-extending buckles. 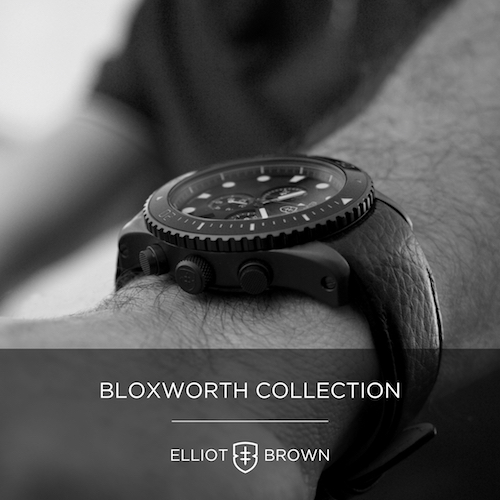 The term "tech diver" perfectly describes the inherrently capable Bloxworth. With it's Swiss, split time Chronograph movement, sweep-back re-set action and the precise, 120 click uni-directional outer bezel, this watch is ready for duty. Tough 3.2mm anti reflective crystal, triple sealed crown and pushers, shock-damping movement shield system, 44mm marine grade stainless casing with a beautifully detailed bolt-down case back and a huge choice of interchangeable straps are just a few of the built-in features of every Elliot Brown. The Bloxworth is built to go the distance and manages a very clever disappearing trick of looking much smaller than its vital stats would suggest, thanks to precise surface detailing that makes the Bloxworth perfect for any occasion. 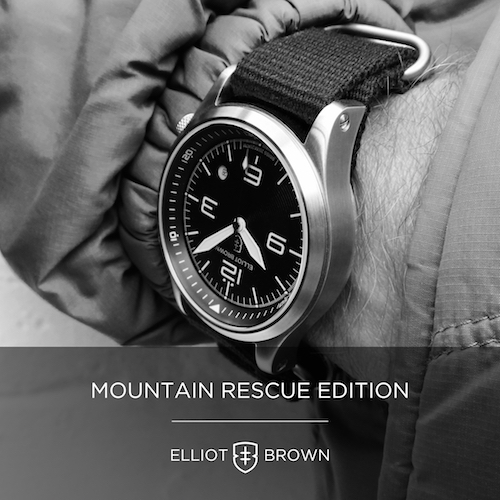 Elliot Brown are well known for their durable, tool watch aesthetics - something not lost on the organisers of the Clipper Round The World Yacht Race or the board of Mountain Rescue England & Wales - both of whom have commissioned Elliot Brown to create two very special editions capable of keeping time reliably in extreme conditions. The handsome Mountain Rescue Canford with it's unique dial and specially engraved case back generates £36 from the sale of every watch for these unsung heroes of the mountians and lowlands - often the first of the emergency services at the scene, yet they are all hardy, unpaid volunteers prepared to give their time and expertise to help rescue people in trouble. The Mountain Rescue special edition is mounted on a fitted, black premium leather deployant strap with an additional NATO style webbing strap mounted inside the gorgeous canvas covered presentation box, with commemorative card and two screwdrivers for easy strap changes. The Clipper Race Ltd Edition Crew watch is the exact same watch worn by the yacht race skippers as they battle the worst nature can throw at them on an 11 month circumnavigational race around the globe - racing 24 hours a day during every leg aboard 70ft Clipper ocean racers. This Ltd edition commemorates the 10th running of the Clipper Race 15/16, featuring unique red and green hour markers as a timely reminder of port (red) and starboard (green) channel markers - a comforting sign upon entering the safety of any port. 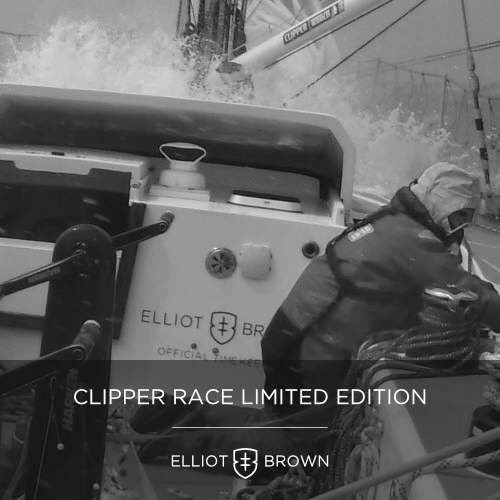 The unique "Crew Edition" case back features the Clipper Race insignia, each with it's own individually engraved number. Limited to just 1000 worldwide, every watch comes with a commemorative hand signed certificate from Elliot Brown's Founders, an additional black canvas deployant strap and two screwdrivers for strap changing duties.